Chelsea were sublime on Saturday as doubts about Antonio Conte’s future were cast aside. The Italian looks to have found his strongest side at the club after the move to a 3-4-3 formation. It always looked to be an intelligent decision to appoint the Italian due to his tactical flexibility and his decision to utilise a formation that isn’t often used in the Premier League. 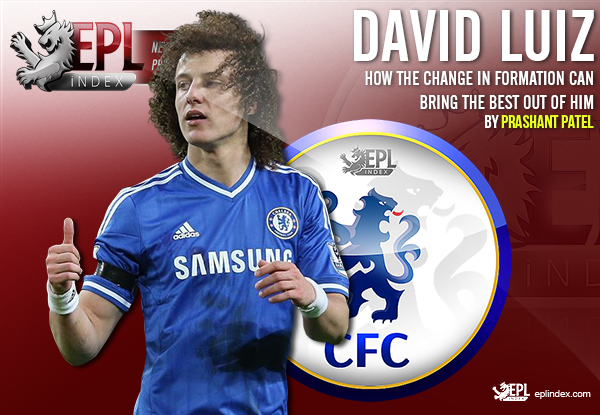 He isn’t afraid to innovate and that provides an element that has been missing at Stamford Bridge in recent seasons. One player that looks set to benefit from the change of formation is David Luiz, who has yet to find his form after returning to the club. The centre back was excellent against Leicester City, in both halves of the pitch and his performance will have excited Chelsea supporters. The change of formation has freed up the Brazilian as Chelsea now have three centre backs on the field. David Luiz was allowed to roam forwards into the attacking half and that has provided him with more opportunities to influence the game. His passing range was on show against Leicester, as he often stepped out of defence to pick a pass to a team-mate. He is always looking to be aggressive with his passes and he launched several attacks from deep on Saturday. He finished the match with an 87% pass accuracy and one key pass. His influence was evident from the first whistle and his technical ability is needed in the side. Chelsea have a midfield partnership of Ngolo Kante and Nemanja Matic, neither of whom are the best passers of the football. The former showed that he can influence the game somewhat on Saturday, but it certainly isn’t why he is in the team. This has increased the importance of Luiz, who can step between those two and dictate the tempo. Conte has recognised the limited technical ability of his midfield duo and moved to a formation that hides that. His set piece ability was on show at Stamford Bridge as he came close to scoring from a free kick on two occasions. The centre back’s first attempt was unlucky as he struck the post with a powerful effort. It would have been a perfect way to cap off a great performance, but it wasn’t to be and Luiz’s wait for his first goal in his second spell at Chelsea continues. It wasn’t only his ability on the ball that impressed, as the Brazilian showed that he can contribute defensively, despite his reputation for being unpredictable. He dominated in the air as he won five aerial duels, but it was a key interception that was his most significant contribution. He directed a dangerous cross against his own post to prevent Jamie Vardy from having the tapping the ball into a gaping net. Although it wasn’t convincing, Luiz had to do something or Leicester would have had the chance to get back into the game. There is room for improvement for Luiz, but this was an encouraging performance that showed he could be a big player for the Blues this season. The decision to bring the Brazilian back to the club for a second spell had the potential to go badly wrong and the initial performances suggested that it was heading that way. However, the change of formation has provided him with a new lease of life as Conte has found a way to hide his flaws. Luiz now has the freedom to influence the match with his ability on the ball. It will be interesting to follow his progress over the next few weeks, but he will be a big player for Chelsea if he can add consistency to his game. Categories: Chelsea (NN), Cheslea, EPL Index Featured Article, and EPL Index Player Profiles.' 'Tags: Antonio Conte, Chelsea, Conte, David Luiz, Leicester City, Luiz, Matic, N'Golo Kante, Nemanja Matic, and Paddy McNair.